Our educational program addresses all areas of development – intellectual, social, physical, emotional, and spiritual. The classroom environment facilitates learning using centers including reading/books, dramatic play/home living, writing/alphabet, math/blocks, science/sensory, and art. 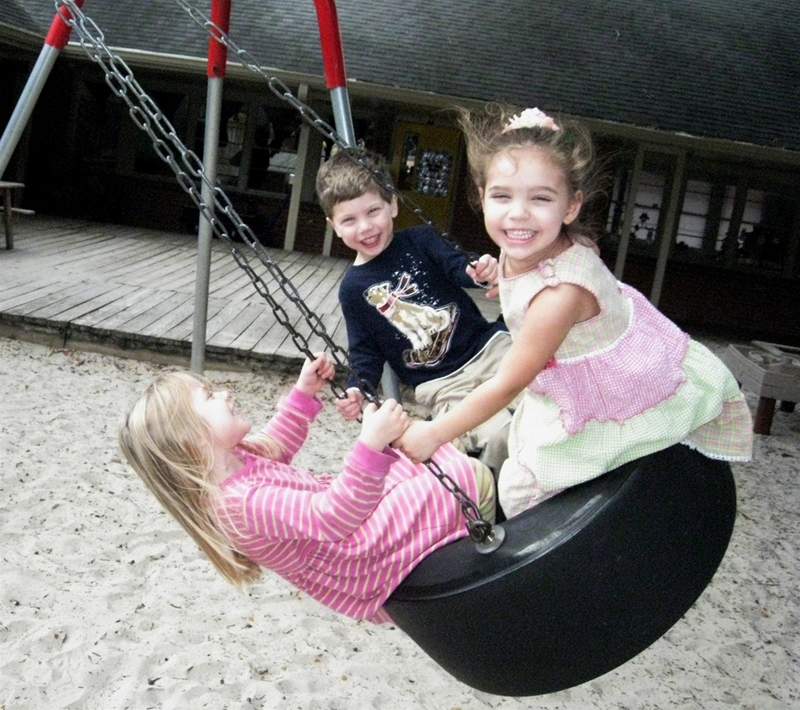 The classroom extends outdoors in our cloistered playgrounds which include large wooden climbing structures, dramatic play structures, sand boxes, and large mature trees for plenty of shade. What does Bethany's curriculum model feature for the birth-to-three population? Bethany Methodist Weekday School has adopted the Early Learning Standards published by the Georgia Department of Early Care and Learning for classrooms in our early childhood program. The Georgia Early Learning Standards (GELDS) are designed to assist families and providers in understanding typical development for children from birth through age three. The standards are designed to reflect children's individual rates of development, their different approaches to learning, and the cultural context in which they live. Each classroom plans their lessons to best stimulate the skills and milestones we see during these formative years. You can find the Georgia Early Learning Standards here. How do you ensure your children are prepared for Kindergarten? In accordance with the Texas Education Agency, Bethany Methodist Weekday School consults the published Texas Prekindergarten Guidelines and the Texas Essential Knowledge and Skills for Kindergarten for our curriculum development and instructional planning in our Pre-Kindergarten and Bridge-Kindergarten programs. These guidelines offer detailed descriptions of expected behaviors across multiple skill domains that should be observed in 4-, 5-, and 6-year-old children by the end of their Pre-Kindergarten or Bridge-Kindergarten experience. The guidelines are developed to be useful to a broad audience including school districts, Head Start programs, child care centers and most importantly, by children’s families. The guidelines also offer suggestions on strategies to deliver developmentally appropriate experiences for the learning needs of all children, ensuring an effective, efficient Prekindergarten & Bridge-Kindergarten year. You can find the Texas Prekindergarten Guidelines here. You can find the Kindergarten TEKS here. Offered in all age groups and classrooms, students participate in a weekly Chapel of developmentally appropriate songs, art activities, and Bible stories. Children will learn that God loves them, made them, and cares for them-- always. Music classes offered by Half Notes Early Childhood Music with instructor, Jeff Tedder. These 15-20 minute classes are offered once-a-week to children enrolled in our Infant, Waddler and Toddler programs at no additional cost to parents. For more information, please email halfnotesecm@gmail.com.